Many times through the years I have been fearful. I have been afraid of the dark, heights, rodents, and spiders. I can remember about seven years ago when I was in the hospital with kidney and liver failure due to my chronic illness and side effects to the medications, the doctors were confused as to how to care for me. After 24 hours I was to another transferred to another hospital. I was in a great amount of pain, edema all over my body, my skin was an ugly pale yellow, and I was in and out of sleep due to medications. I was separated from my family while the doctors and staff worked on me performing a multitude of tests. All I could think about was that I was going to die without any family members beside me. Not long after the thought of dying came to my mind, a calm assurance rushed over me and I could hear a sweet soft voice inside say, “Fear not! I am with you.” For those of us who know the Lord, Isaiah 41:10 is extremely assuring. 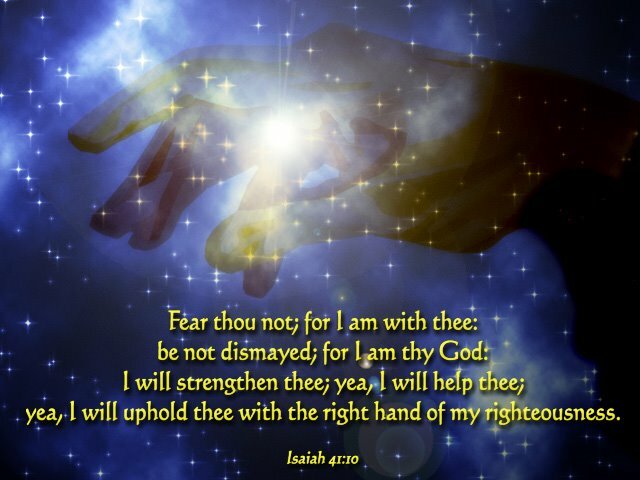 It tells us why we are not to fear: 1) God is with us (“I am with you”); 2) God has established a relationship with us (“I am your God”); and 3) God gives us assurance of His strength, help, and victory over sin and death (“I will strengthen you, help you, and uphold you.”). In God’s comforting grace and mercy He removed my fear that day and placed it upon Himself. He assured me that my life on earth was not over; He put within my heart a new purpose; to live simply; laugh often; and to love deeply. Heavenly Father, I am so thankful that when life’s trials and sufferings become so great that we are full of fear and despair, that we can run into your ever loving arms and rest secure in your promises that You are our God; You are with us; and You will strengthen us to continue to live for you another day. In Jesus Precious Name, Amen. I love that verse and have clung to it many times. I am so grateful that He has given us strength and comfort through His Word. I love you, and you remain in my prayers. I remember this time last year being in hospital with pneumonia and a collapsed lung a liver issues.....and in a four bed ward I was not always able to drift off to sleep but I recall one night where I just counted the blessings of being able to lie still and be in the presence of my Father and to just quietly share with Him. Amen. This verse speaks to me in a powerful way, as well. Thanks for the reminder! Thanks so much for the visit and even more for the gracious comment. 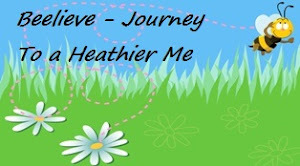 Here's hoping you'll become a follower and my blog will be a blessing to you as yours is to me. It is such a gift that we do not have to leave in fear! Awesome thoughts! Hi there, Thank you for stopping by my blog and for your kind comment. I enjoyed reading you post and will be back for visits-you have a gift of mercy that is evident. We are so blessed to serve a loving and comforting God. The verse you shared is one of my favorites. I've heard the Bible contains 365 instances telling not to fear. (Can't confirm that number, but I know it's close). That's one verse for every day of the year. A very encouraging and uplifting post. One of my favorite scriptures...loved your testimony! What a testimony. My favorite verse I cling to in fearful moments is 2 timothy 1.7. Your scripture on your banner just washed over my spirit Michelle. I NEEDED this..than I scrolled down and read this devotional..and again, the Lord spoke to me through it. Thank you...thank you for sharing your heart..it greatly ministered to me.